The University Writing Center will host its eighth annual Dissertation Writing Retreat from May 13-17, 2019. We encourage all writers currently working on their dissertations to apply. In past retreats, we have worked with writers representing a range of disciplines from Public Health to Engineering to Social Work to Humanities. Some of these writers had just begun writing, some were in the middle of their writing projects, and others were getting close to completing their dissertations. Regardless of where they were in the process, all the participants made progress on their dissertations and left with a set of writing strategies that would help them maintain their momentum on their projects. If you want to read about how the participants from last year's retreat thought the retreat helped them, take a look at this post from our Writing Center blog. At this year’s retreat, writers will write for several hours each day; take part in short, writing-focused workshops; and work with a writing consultant for an hour each day. The University Writing Center consultants who work during the retreat are experienced writing teachers who are also PhD students currently working on their dissertations. Each participant in the retreat will be paired with the same consultant for the entire week. 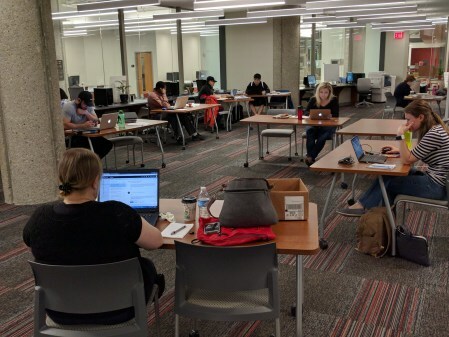 The Dissertation Writing Retreat is organized by the University Writing Center with support from the School of Interdisciplinary and Graduate Studies. The retreat will take place in the University Writing Center in the Ekstrom Library and will include lunch and snacks. There is no fee for participating. The retreat will be held on May 13th-May 17th 2019, 8 AM to 4 PM daily. Participants must be willing to attend the entire week. Applications are due by March 30. 1. A letter written by the writer stating his or her reason for applying for the Retreat and goals for the week. 2. A letter of support written by the writer’s adviser/director. 3. Any documents related to the dissertation (i.e. drafts, proposals, etc.). Completed applications will be considered, and accepted, in the order in which they are received. There are 14 openings for this year's retreat. Once those openings are filled, other applicants will be placed on a wait list. Priority will be will given to applicants who have not previously participated in a Dissertation Writing Retreat. If you have questions about the retreat, contact the University Writing Center at 502-852-2173 or writing@louisville.edu.